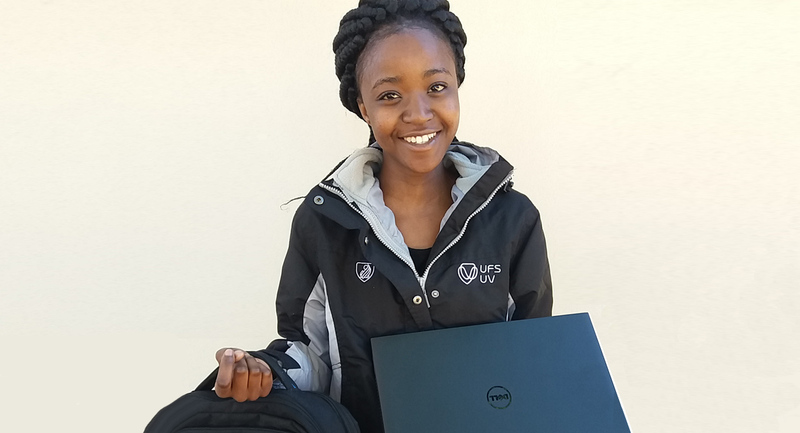 Three South African students are the first to benefit from a partnership between De Beers Group and computer giant Dell that will cover all their university fees and study expenses. The young trio, from the company’s mining communities, were selected from the De Beers Financial Study Assistance Scheme and awarded R80,000 each towards their tuition fees and study material by the Dell Development Fund. They also received brand new Dell laptops as part of the bursary. Maanda Makgatho, Ndlaleni Mkwanazi and Anisa Camroodien initially applied for R25,000 each but ended up with more than three times as much. Ndlaleni, 19, from Kroonstad is a second year student at the University of the Free State, studying for a BSc in forensic sciences. She was awarded 10 distinctions during her first year. Anisa Camroodie, 21, from Kimberley, Northern Cape, at the same university, also thanked the two companies for enabling her to focus on her studies and not worry about money. Anisa, studying for a BCom accounting degree, also got 10 distinctions in her first year. Maanda Makgatho, a 23-year-old from Musina, who will complete her law degree at the University of Pretoria this year, has no doubt about the importance to her of the bursary. Gregory Petersen, Senior Commercial Manager Enterprise and Supplier Development for De Beers Consolidated Mines, said the country’s young people had an essential role to play in shaping the socio-economic landscape of South Africa and in bringing about change. “At De Beers, we believe in the socio-economic transformation of our surrounding communities and through initiatives such as these we hope to make a lasting contribution,” he said. The De Beers Financial Study Assistance Scheme is currently providing financial support worth R4 million to 219 students, with the aim of contributing to the pool of skills in the company’s host communities.